Oh wow, I am actually getting a chance to update the blog! For those of you who have been waiting patiently, thank you. 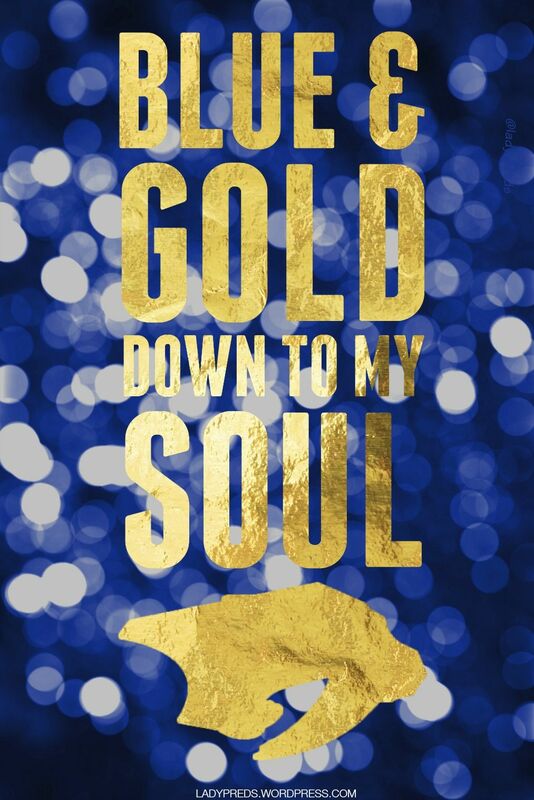 I am wrapping up my senior year at Tennessee Tech and – along with work – it has me pressed for any kinds of free time. It’s worth it though, really. Any who, enough excuses — What excuse does Nashville have with this scoring drought their experiencing? Since I last posted an article, the Predators have had twelve goals in six games. Okay, so it’s not all about how many you can score — this is hockey, not basketball. Well, what if I told you, in those six games, Nashville tallied 198 shots-on-goal. Needless to say, it isn’t a matter of why aren’t the Predators taking shots (because they clearly are), it’s why can’t they put the biscuit in the basket? Which teammate pissed off the hockey gods? Well, let’s just move forward into the recap, shall we? • Arizona would get the ball rolling first at 17:20 on a powerplay goal from Oliver Ekman-Larsson for his sixth goal of the season. • Despite knocking 13 shots-on-goal compared to Arizona’s 4, the Predators trailed the Coyotes going into the second period 1-0. • Mike Fisher went down in an awkward stance, leading to him slowly limping off the ice. While it doesn’t look like much, he did not return to the game and is expected to be our for the next four games. • Calle Jarnkrok would finally slip one past Mike Smith at 12:32 on the powerplay for his fifth goal of the season. 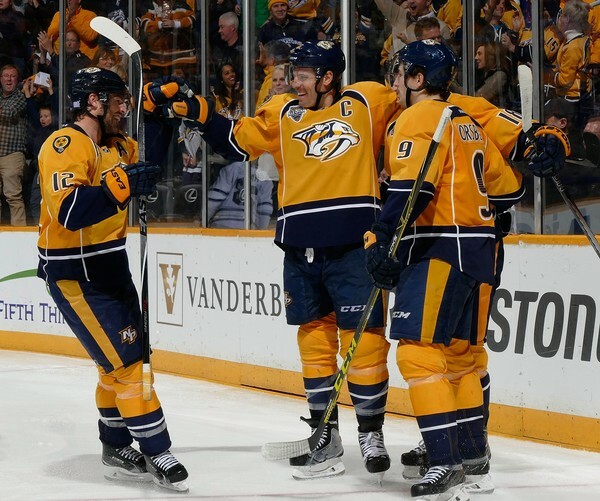 Shea Weber (5) and Filip Forsberg (11) would tally the assists. • However, Kyle Chipchura would answer at 17:09 to retake the lead going into the third period. • At 2:33, Mike Ribeiro did something we never thought he’d do… he shot and scored for his third goal of the season! Cody Hodgson picked up his fourth assist as well. • Two minutes later, at 4:49, Filip Forsberg would end his goal-less streak for his fourth goal of the season. Craig Smith (3) and Shea Weber (6) collected the assists. Ah, but he released his inner Craig Smith and completely woofed it. Whoops. • But Filip Forsberg would answer the Frosty call at 17:01 with a beautiful feed from Mike Ribeiro for his fifth goal of the season. Ribeiro would collect his eleventh assist along with Shea Weber who collected his seventh. • James Neal would make up for that missed opportunity at 19:10 with an empty-netter to seal the game 5-2 in favor of Nashville. Neal would notch his 10th goal, along with Roman Josi picking up his 11th assist. While Nashville certainly woke up in the third period, is their scoreless streak finally over? I wouldn’t bet my money on it just yet. While they are making a consistent effort, something just isn’t connecting. Coach Laviolette made some notable line change-ups last night that aided in securing the win, but there is still a missing element. With the need of a top center added to the roster and the possible loss of Mike Fisher for a good while, Nashville may find itself in a toughie for a bit. Maybe not. Who knows. The Predators welcome in Jaromir Jagr and the Florida Panthers tomorrow night at 7PM. Ahh, the Florida Panthers. Other than a bout in the preseason, Nashville and Sunrise haven’t met until now in the regular season; and boy, are the numbers lopsided: 7-5-6 for Florida and 13-5-2 for Nashville. However, as you should know from us, we aren’t about numbers. Numbers do not foretell who is going to come out on fire or who’s going to have a bad night. You have to give the Panthers some credit; facing multiple injuries that have forced them to call up some young, inexperienced-in-the-NHL talent and the embarrassing low attendance numbers and home games, Florida has just about everything (including the world) against them. The Predators may be riding high at the top of the Central Division right now, but lest we forget – in the not so distant past – Nashville was scraping the barrel and rumors of movement were floating about. Heck, Nashville still has a long, bumpy road ahead – the Predators are not immune to being out-powered and/or outnumbered. No goals for either side in the first period, but Nashville took a few shots that just couldn’t connect with the goal – 14 to be precise. Florida, on the other hand, only managed four shots-on-goal during the first period. The second period would, for the most part, feel just like the first one, with Nashville slamming Robert Luongo with shots left and right, but none connecting. Finally, at 18:26, Colin Wilson would make one of those shots connect, sending his third goal of the season around Luongo to put Nashville on the board. Calle Jarnkrok (3) and Craig Smith (5) would gather the assists. Matt Cullen would put Nashville up 2-0 at 13:01 for his third goal of the season, with a little assistance from Derek Roy (6). But here’s where it gets dicey: At 19:17, when you think Nashville has a shutout in the bag, Rocco Grimaldi sinks one on Rinne to put the Panthers on the board. Not even twelve seconds later, Nick Bjugstad sends one past Pekka Rinne, tying the game and throwing it into overtime. And this, boys and girls, is why you do not lower your guard until the final whistle is blown and “All I do is Win” comes over the speakers. Five minutes of overtime produced zero goals, with Florida getting no shots on goal and Nashville only pounding five. What should have been a game bagged in regulation turned sour pretty quickly for Nashville in the last few seconds of the third period. Thankfully, overtime and a shootout shook them out of la-la land and back into the game. As I mentioned above, never lower your guard; never assume you have the game won. The Predators welcome in the defending Stanley Cup Champs, the Los Angeles Kings, on Tuesday night and then welcome in the Edmonton Oilers for a header on Turkey Day.